If you’re just getting started with succulents, you may want to begin with a small container garden. Anything with a drain hole can make an attractive vessel for your plants. I have seen succulents planted in an old chrome toaster, a small hibachi and a wooden soda crate. Choose plants to fit your container. If you choose a single plant, select one about an inch smaller in diameter than your pot. If you have a container that can accommodate several plants, be sure to leave some space for them to grow and spread. You can buy several of the same variety but it may be more fun to try different varieties with the same shape. For example, there are many succulents with a rosette shape, such as aeoniums and echeverias. They come in various shades of green and reddish hues. 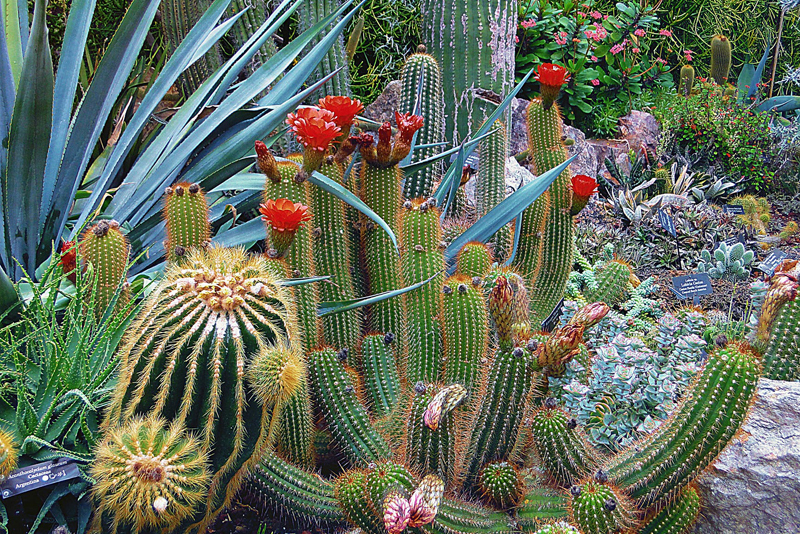 Succulents are becoming easier to find in nurseries and “big box” stores. Small ones are among the most inexpensive plants you can buy. They are also available at dollar stores from time to time. Because they are so easy to start from cuttings, you may be able to obtain plants from a friend or neighbor who is thinning out their collection. Once you have your plants, the next step is preparing the container. Do not place rocks at the bottom or cover the hole with a broken piece of crockery. This just makes water more likely to be retained at the bottom of the pot. If you are concerned about soil washing out, place a piece of screen over the hole. The soil mix for succulents can be the pre-mix cactus soil available at the store or you can make your own with a combination of half potting soil and half pumice or perlite. If you use a commercial mix add some extra pumice or perlite if you have it. Fill you pot part way before putting in the plant or plants. You don’t want an air hole under the plants. If you have different height plants put the tallest one toward the back of your container, and then work your way forward with lower plants. If all of your plants are the same height, you can mound the soil up in the middle. Now that your container is planted, you can think about watering. If you have cuttings, don’t water right away. Plants that already have roots can take a light watering. A watering can with a narrow spout allows you to water without drenching the tops of the plants. Let the container dry out between watering. An unglazed clay pot will dry out faster than a glazed pot so check the soil to see if it’s dry. Many succulents grow more slowly than other plants, so you will be able to enjoy your arrangement for quite a while before you need to repot it. By then, you may have cuttings of your own to exchange or to use for new containers. Content copyright © 2018 by Linda Genis. All rights reserved. This content was written by Linda Genis. If you wish to use this content in any manner, you need written permission. Contact BellaOnline Administration for details.